signed up for their newsletter. So excited to have found their site!! thanks! "And I tweeted about it! " I signed up for the Above All newsletter. Thanks for the great new site. Love the fabric and patterns! raspberry henna garden is beautiful! Nice site .... most of what I love, too! Love that she has Joel Dewberry & Erin McMorris. for pete's sake!! how am i to pick just one fabric in that fantastic shop? i can't!! too many lovely ones, so just have to pick at least two--tweet tweet and mingle--both so adorable and think they'd look cute together. thanks for sharing this great shop!! I like the Nest collection, especially the tangerine and turquoise leaves. I love Erin McMorris forest. I like the Just Dreamy fabric. Thanks for a chance to win that beautiful fabric. I love everything by Sweetwater! I love the peach playful paisley. thanks. If I had to pick,Clover dot lime makes me happy!! I like all the fabric in the Shindig line. I can't decide which I like best. Oh, choosing a favorite fabric is so difficult--but I opt for Luna Moth in raspberry. Signed up for the newsletter. Looks like a great site--gorgeous fabrics! My favorite of the moment is Flora and Fauna. Such rich colors! 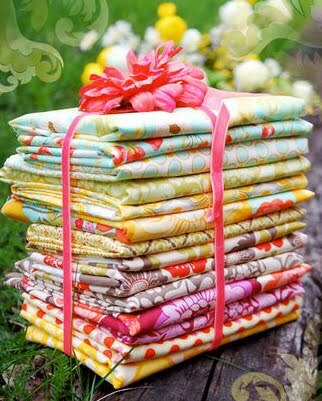 Well my favorite fabric would be the awesome FQ stack of M2! Of course all her fabric is great! Just tweeted about your giveaway Julie! I have ALWAYS hated moths! Now I guess I have love/hate relationship with them because I LOVE Luna Moth-Raspberry!! Such pretty fabric! Some of them remind me of the colors in vintage sheets. I'd love to make some PJs out of the Toffee Elvira knit fabric. I love the Laura Gunn fabrics. Thanks for the giveaway. Jennifer Moore Birds-Teal is kind of funky and I like the colors. I signed up for the newsletter. I don't tweet or blog, so does Facebook qualify? I signed up for the newsletter. Thanks for introducing me to a new store! I love the Park Slope floral circles in green. I blogged about it at raggiegirls.blogspot.com Sorry, I don't twitter. Meadowsweet 2 has to be my favorite thing in the shop right now. I love the new colorway! I've never heard of Above All Fabric. I'll have to keep them in mind! I just love the Nicey Jane Welcome Road print in all the colors! I love Patty young's Flora and Fauna. I am loving the Art Gallery fabric, especially the Lavender plaid! Thanks for a chance at the giveaway! First time I have visited this shop. Love the way it is arranged by theme. She even carries my favorite Amy Schimler! Thanks for the opportunity to win the giveaway. I would love to make a quilt out of Meadowsweet II, it's so beautiful! Those Monaco Scooters are calling my name! They're my favorite! Now that is one sweet giveaway Julie. My fav fabric would be Monaluna's scooters print from Monaco - those scooters just make me smile. The Monaco set is gorgeous. Love Amy Schimler's Owls! I love the colours in the Meadowsweet line. Great giveaway and shop!! I love the Monaco collection. Thanks for the opportunity! I love the Make Life Colorful - Sun. I have wanted a bit of that fabric for awhile. I am all signed up for the newsletter. Yay! NICEY JANE IS CUTE TOO! New site for me. Thanks for steering me to it. My favorite is those really cute Monaluna scooters. I love all the boy fabrics they have. The Monkeys are great, also some owls and 2-d zoo. I signed up for the newsletter. I really like the Farmer's Market fabrics. I signed up for her newsletter at Above All. My favorite fabric right now is "pure". I saw a baby boy quilt made from it that I would love to try someday! Well, I definitely need more of those nicey jane dots for a baby quilt for a friend, so I guess that's my fav! I don't even have to look at the site to know that my favorite fabric is Anna Maria Horner's Little folks! I'm now signed up for their newsletter! I love the Nest Corduroy and the Carnival Bloom corduroy. They would both make such cute jumpers for a little girl! I signed for their newsletter. Thanks for the giveaway, I had never been to that store. :) I love the new henna garden colors in meadowsweet 2, especially in grey. Wonderful! I didn't know about Above All Fabric--they have a beautiful selection. I love the Mo Bedell Party Dress Rambler fabric in Soiree. I already get her newsletter! I've been having a recent weakness for the Patty Young knits and I've bought them thru Melanie-she offers great prices & service, and love her shipping rate, too! My favorite is AMH voile Coloring Garden in Sea. Soooooooo soft! Love the AMH voile! So soft. Of course I love the Amy Schimler monkeys! I was looking for this a while back and couldn't find it. Now I know where to go! I love the Alexander Henry 2d ZOO! I love above all fabric! I've purchased for there before and they are wonderful! Wow so many to choose from. I like Summer Song from her website. Very lovely fabric selections. Thanks for introducing me to Above All Fabric. My favorite is 2D Zoo - Pool! I love the Henna FQ set! One of my all time favorites. I think my favorite is the behive jive bundle....how happy it looks!!! I also signed up for their newsletter...thank you for letting me know they had one. I checked out the shop- I love the Stop 'n Go fabric- too cute! I'm still obsessed with Modern Meadow by Joel Dewberry! Thanks for the giveaway, the Meadowsweet 2 is beautiful! Right now, I'm loving the look of Alexander Henry's Willow Berries-Dusty Pink. Yummy in more ways than one! Tweeted! I'd LOVE to win this giveaway. I love those birds, and the monkeys! My favorite is the Henna Garden (part of the Farmer's Market collection). I love it in all the color ways. What a nice selection she has! Awesome. I signed up for the updates. i love Ginger Blossom, so pretty. Love Lollipop dream, so CUTE!!! meadowsweet 2 hands down is my favorite from her shop! I signed up for the newsletter...love the Flora and Fauna collection in Lime. I love the "Garden Splashy Rose" it would be perfect in a quilt I'm making right now! Oops! Consider this my "subscribed to the newsletter" entry! I am signed up for the newsletter. nlundeen at catt dot com. I love the Meadowsweet 2 line and also the Anna Maria Little Folks line. I think I have most of those though. Ooohhh, I love those monkeys! And of course, the Meadowsweet! Thanks for the giveaway! awww, I love the 2D Zoo Pool print from Alexander Henry!! I love all the fabrics, but I really do like Party Dress. I love all of it! I can't even choose. I think I would pick some of the really new modern stuff... like meadowsweet. It would be fun to have some of the little bird corduroy by Valerie Wells for sewing little toddler size jumpers! I'm coveting some Summer Song from Riley Blake. Yum yum! I LOVE the monaco collection by monaluna. Soooo pretty! And organic to boot! Thanks for the chance to win some meadwosweet. That line is so pretty. I just love "Creatures & Critters" fun fabric!! Thanks for such an awesome giveaway! I have signed up for Above All Fabric Newsletters and since it is new to me I am thrilled to have access to a fantastic site. Thanks for this fabulous giveaway!! I love her tea party treats pattern. That is adorable! I LOVE the Dahlias of Farmer's Market - I think I could do my whole house in it! so that is my fav at Above all fabric. I signed up for the newsletter also! Thanks for the contest. Robins Egg Daisy Path is my pic. I love Alexander Henry Willow Shroom - Green and Laura Gunns Poppies (I couldn't choose just one!). I like the Basic Grey line, especially the Cherry Cordial-Milk Chocolate. Very rich. Or maybe I'm hungry. Thank you for the great give away and for the wonderful new shop!! I love Just Dreamy, Large dream dots!! I love Pillow and Maxfield's Whimsey line! Great shop with great fabrics! My fav is poppy by Laura Gunn. I'm lovin' everything she has under Theme - Dots. I love the 2D zoo-pool and Lindy Leaf (in pink) Such a cute site! Right now I'm loving Heather Bailey's Nicey Jane fabric. Thanks for the chance to win Sandi Henderson's beautiful fabric! 2D Zoo Pool is my fav. whimisical and great. Looks like a nice shop. I'm loving the Alexander Henry Zoo Pool fabrics. I LOVE Little Folks voile, so soft and so pretty!! I love the Alexander Henry Zoo-Pool fabric. So cute! Signed up for the news letter also! I love Anna Maria Horner's voile (especially the Forest Hills in Sea). It is so soft...I just want to pet it! I REALLY like the Cherish - Essence fabric! I have subscribed to Above All Fabrics' blog, also! Meadowsweet 2 is looking good! I've always loved Wildwood Forest in Fuchsia! What a great store, and a fun giveaway! I love Geranium Splashy Rose as well as the Citrus Splashy Rose....too cute for words. Signed up for the newletter, looking forward to getting it !! I really like Laura Gunn's Poppies, especially Tile Mosaic in Citron. Thanks for offering the giveaway!